University professor Jonathan Kotler said he was "shocked" at the decision. "It's just a shirt colour," he said. Prof Kotler applied for a plate that would read COY-W - an abbreviation of the slogan commonly used by Fulham football fans - and a hashtag seen every weekend on many Twitter posts about the club. 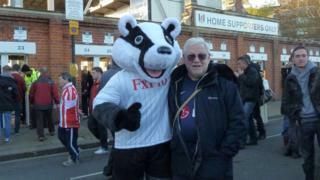 The 73-year-old, who was born in New Jersey and now lives in Calabasas, California, has been a fan of Fulham FC for decades, after watching a match "by happenchance" during a visit to London. "I sent them tons of material," Prof Kotler told the BBC. "Press releases, stories from the British media, letters from the chairman who uses 'come on you whites'. "I pointed out that many clubs in Britain are known by their colour - the blues, the clarets. Nobody thought the Liverpool reds were communists." He said the club's owner, Shahid Khan, "uses the phrase all the time". In his legal complaint, he is asking the court to declare the DMV's criteria for personalised licence plates unconstitutional. He claims he has been deprived of his right to freedom of speech. The number 69 is reserved for cars made in 1969.